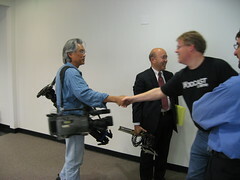 ABC 7 comes to PodTech, media mixes. Earlier this week I had Justin TV come to the office, that was an interesting real-time experience. 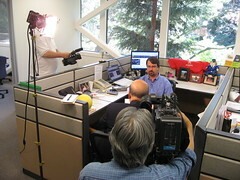 Today, ABC 7’s David Louie comes to interview Robert Scoble and John Furrier at PodTech HQ. The subject, the hot topics of online behavior and civility. It will air tonight at 6pm on Channel 7 in the bay area. I’ll link to it if it goes online. It was pretty “meta”. As CBS walked in, we Twittered they were here, people talked about it, I took pics from camera, and posted on flickr in less than 2 minutes. They started videoing, conversations started on Twitter then on flickr. All this before the actual piece has aired on TV. when they air it, hopefully we’ll link to it and it extends it’s life. If only Justin TV was here. Media compounds media. Update: the video from ABC is available online, I’m impressed, they’re getting the whole online experience thing. I posted the following pics to flickr in near-real time and then twittered it, it made for an interesting intersection of media.